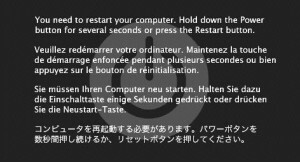 You need to restart your computer kernel panic -OSX-SOS! 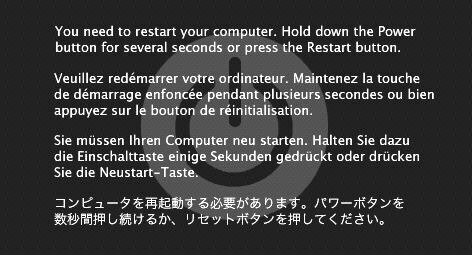 Occasionally this message may appear and your Mac will become unresponsive. causes include: Outdated software, outdated firmware, defective hardware, defective RAM and lack of available disk space. If your Mac has another kernel panic starting up, or while in Safe Mode, go to the “Troubleshooting a recurring kernel panic” section below. Important: If the Mac has another kernel panic within a few weeks, refer to the “Troubleshooting a recurring kernel panic” section below. Note: If the hardware and software on the Mac checks out as OK, yet recurring kernel panics still occur, it is possible that something on the network is sending the Mac malformed network packets. In these situations, check the devices on the network. Make sure the router’s firmware is up-to-date, and that the router is functioning. Refer to the router’s manufacturer for service and support. Update your software: Outdated software is frequently implicated in kernel panics. This may include OS X itself and, very rarely, regular applications. Update your firmware: Software Update may also tell you about available updates for your Mac. Check your disk: Make sure your startup disk has at least 10GB of free space; if it doesn’t, delete some files to make room. Check peripherals: If kernel panics continue, shut down your Mac and disconnect everything except the bare minimum (keyboard, pointing device, and display if those aren’t built in)—as well as any hardware you’ve added inside your Mac, such as a graphics card. Check your RAM: Defective RAM is a common cause of kernel panics, and sometimes these defects manifest themselves only after time. If you’ve added any after-market RAM, try turning off your Mac, removing the extra RAM, and restarting. If that makes the kernel panics disappear, contact the company that sold you the RAM to see about a warranty replacement.